Glassrooms News A Conservatory or GlassRoom? 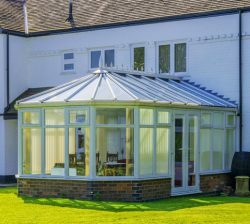 A conservatory or Glassroom are a great way to extend your living space. Both have several methods of construction and both aim to maximise your natural light and give you better views of your surroundings. The main concept of each of these constructions do differ. 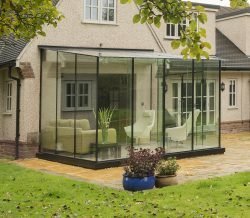 Conservatories are more of an extension of your home, whereas Glassrooms are a way of bringing your garden indoors. Conservatories ate often the most cost-effective way of increasing a floor plan of a home. They wear once legally defined as a structure with 50% of its side walls glazed and 75% of its roof glazed with a translucent material, most commonly Glass or plastic sheets. More recently the specification has changed to come and line with those of brick extensions – meaning they need the same planning and permissions. This now means they need to be double glazed and insulated, more recently companies have started to add solid roofs. Glass rooms are often referred to as a sun room or a glass box, this is because they have more glass than any other material to form their construction, they often use glass beams and structures alongside floor-to-ceiling glass walls, glass floors and a glass roofs. There are many add-ons you can get for your Glassroom that are great for UV protection and privacy. Our GlassRooms system has been designed by award winning architects, structural glass engineers and leading independent test engineers. Constructed in-house at our factory, from toughened glass units, specified to meet the needs of your environmental demands, our system manages heat loss and solar gain with the state-of-the-art glass technology. – Bespoke and made to measure with precision measurements and laser cuts – you can view some of our recent installations here. Conclusion – If you are not restrained by your budget then a Glassroom would be our recommendation. The fact that we can be so bespoke with our design and very precise with our measurements allows us to develop Glassrooms for all types of scenarios. Whether you are living in the middle of the countryside and looking to bring your garden indoors or whether you are in central London with restricted living space and looking for a solution to enjoy the outdoors whilst being protected from the elements – we can happily provide you solutions. We are here to design, manufacture and install bespoke glass solutions. Our dedicated team, partners, affiliates and suppliers welcome the opportunity to work closely with you to create a GlassRoom solution that transforms your living space. If you have a project you would like to discuss then please call us on 0151 651 2798 or complete our contact form and we will be in contact.